Pecan Pieces soaked in our own raw honey. Two delicious products that are each so beneficial for your health. So good over a bowl of oatmeal, ice cream or yogurt. A great gift for someone that loves these flavors. Available in two sizes. A trio of delicious fancy half Kernels with your choice of flavors. Choose raw unflavored, candied, chocolate coated, cinnamon or chili pecans. A one or one and a half pound tin with your choice of two raw or flavored pecans. Choose from Cinnamon, Candied. Chocolate or Chili flavors. Available in 1 lb. or 1 1/2 lbs. 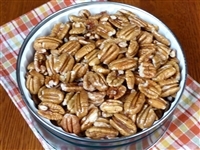 and in raw or flavored pecans, This is sure to thrill your friends or clients. Add Texas flair to your gift with this 2 lb. basket filled with tasty pecans, raw or one of three flavors. Sure to delight the recipient. 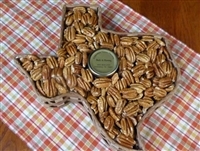 Two pounds of tasty Mammoth Pecans with a 6 oz jar of Nuts and Honey tucked inside a Large Texas Basket (11X3X13). A wonderful gift for someone you love. Full of nutritional value.